It is not every day that a classic that will be read for years to come is published. Yesterday was such a day. And the classic in question? 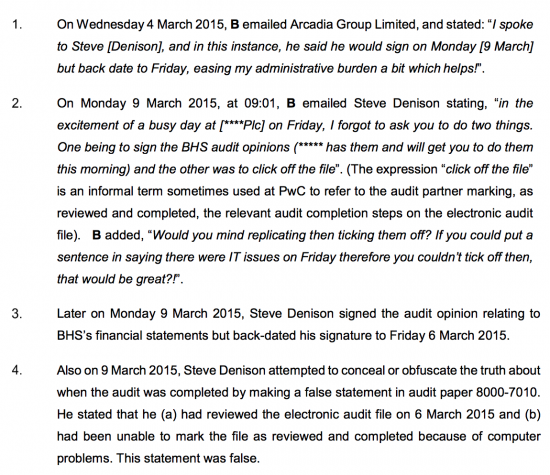 The Financial Reporting Council's report on PWC's audit of BHS. I have read all 39 pages this morning. It's hard to describe how shocking the report is. It's especially shocking to me as a former audit partner, and when I compare just how weak PWC's systems were when compared to the procedures my own firm used to follow to ensure audit quality control. Let me focus on some facts, first of all. These, on hours recorded on the audit, are interesting: The focus has been given by many to the near absence of time expended by the partner and senior manager. But I am shocked by the tiny total hours: just 154.5 hours, or less than five weeks work, much if it by very junior staff, was expended on this audit. The audit fee was £355,000. The average charge per hour was, then, £2,297. That is either daylight robbery, or someone at the FRC is misreporting facts. If the hours recorded were true then at every possible level of work this audit could not have been properly undertaken. And gross mischarging took place. It may have been both. But let's stop the pretence that audit is not profitable in that case. This ratio is shocking. And what is more shocking is that the audit partner headed the supply of the non-audit services. There was no pretence at a separation of duties and so any audit objectivity. The same person who could give 2 hours to the audit could, over the same period, given 15 times that amount of effort to non-audit services. This is shocking enough, but the gross negligence of the actual audits, outlined in some detail in the report is also incredible. 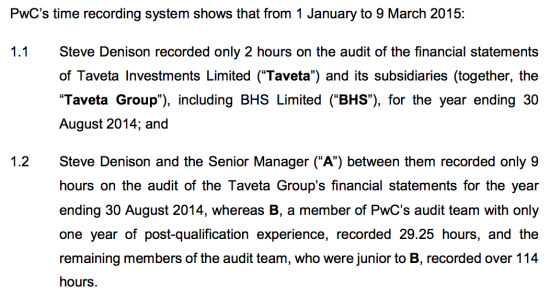 The turnover of BHS was basically not audited: it was only checked as part of the group but individual accounts were also signed off, of course. This was just wrong. Nor were large parts of the cost of sales audited. And major intra-group adjustments were simply ignored. Whilst the basic question of whether a company in such obvious trouble was a going concern or not, and so able to meet its financial obligations, was simply not tested at all. Indeed, the auditor who did most of the work, who had only one year's post qualification experience and may, therefore, have had just four year's experience in all, was not even aware that a sale was planned and did not allow for it in the audit work. Her manager and the audit partner did not apparently notice that deficiency. Which was not surprising as they could hardly have looked at the file at all. This is not just a tale of woeful incompetence, although it is that. It's also not just a tale of fraud, although that happened. It has to be a tale of systemic failure: I cannot believe that this was just the proverbial 'rotten apple', yet again. For such a situation to have arisen here it must have been sufficiently commonplace for no one to have noticed anything amiss in what was happening. The implication is for the firm as a whole, and not just this audit and this partner. And what of the penalty for such utterly gross incompetence and fraud? At £6.5 million for PWC it was less than a per cent of profit. It was a cost of doing business at more than £2,000 an hour. An inconvenience if the rest of the show can stay on the road. My suggestion is the Financial Reporting Council has also failed here. PWC should have been barred from taking on new audit work. The FRC should have ordered a review of all its major audit files. Evidence of replication of the risk should have been sought: how many other audits were signed off with just two hours of partner time, for example? It would hardly be hard to identify them, and so pick the files for review, after all. But nothing of the sort has happened. Despite such gross failure, PWC is still selling audit services today. And the question has, then, to be asked as to why that is, and why this business model is permitted to exist? I discussed rent-seeking in the context of CEOs yesterday. I will suggest there is rent-seeking in these firms as well. What is very apparent is that just as CEOs cannot justify their salaries these firms cannot justify their fees. But they, or rather their partners, get away with them because they can exploit the rent that their firm name permits them to charge. There is no value added. There may be no service at all. There is just a fee and a veneer of service that the FRC will not disrupt and so the rent-seeking, rather than the service, goes on. This country; our financial system, and all the people who depend on it; they all need real audit services. I suspect, very strongly, that they are not getting anything close to that service and that BHS is not atypical in any way. PWC just made the mistake of being found out. This rotten system needs root and branch reform. Of the regulator. Of the obligations of the auditor. Of the law. On the way firms are permitted to operate. And on their accountability. Will we get it? Or will the rents just continue to flow to those who have not earned them? What do you think? It will go on until a courageous Government stops it. That really is the only way in my view. Do you you think it has anything to do with George Osborn changing the law regarding criminal responsibility of Auditors? I know you used to work in audits, but I didn’t know you’d made partner. You’ve certainly had a busy life. Aka Richard, Sarah & Sally. But as usual RM is absolutely right – the behaviour of the Big 4 has been scandalous, and continues to bring the profession into serious disrepute. 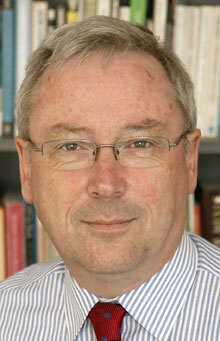 The ICAEW Council can do nothing as it is stuffed with placemen from the bigger accountancy firms. Time for a new public auditor, tasked to conduct a random sample of work done for the FTSE 350 companies every year; pay decent salaries to honest accountants to do a proper job; and have the powers to fine substantially (and to hand out lengthy bans from audit and consultancy work) those firms where it discovers that earlier audits were insufficiently staffed and ineffectively performed: as with PCW’s utterly cynical betrayal of customers, staff and shareholders at BHS. Lest we forget but the Philip Green empire was – and presumably still is – centred in Jersey through an obscure series of “companies”. But I am not aware that these have ever been properly scrutinized or critically examined either in the UK or Jersey. If they are outside of the reach of UK institutions – is there any Jersey body that should be looking at them and the professionals who advise(d) them? There was at least one Taveta in Jersey…. There is something rotten going on, why so many put up with it I don’t know. 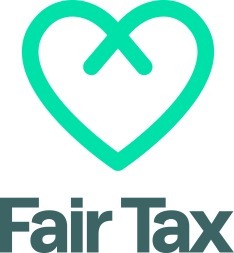 Take the HoF going into administration using a big four accountancy firm then a quick deal with a major share holder of Debenhams who just so happen are appointing the same big four firm to do their audits from next year. No conflict anywhere – no inside information? No way. We don’t have a system that anyone can trust. Bear in mind it was a 30 August year end, not 31 December. The hours reported by the FRC are just for the completion stage of the audit between January and March. Many more hours will have been charged by junior staff during earlier planning and fieldwork stages in 2014, probably significantly less than £250/hour. So being fair to the FRC, you’ve misinterpreted that part and compared apples to oranges. Doesn’t change the rest of your criticism though. You describe this as, “a tale of systemic failure”: but I do not see this broader perspective in the FRC report. The FRC report is very detailed on specific failings, but it does not draw any general conclusions. Indeed the structure of the report feeds this very specific, narrow approach. It struck me that there was, so far as I could see, no exective summary. There was no context. There was no perspective; for example, what are the standards here? How many hours (at least broadly) might we expect would be required for an audit of this scale, in the particlular circumstances of the company or at least sector audited? How many hours at partner level? Where might we expect the audit time to be apportioned in the company, and where? I am sure there are many other comparatives we might explore, but I have no sense of any of this. So I would ask here; how should we audit an audit? I think you misunderstand my intention. I was not criticising your statement, I was attempting to examine it, and what the FRC was doing. What should an audit of an audit look like? I say this because it seems to me that is what the FRC should produce – in the public interest. in HoF’s case). Add on the cost of rescuing pension funds and the third-party costs are massive. If we ever do manage to tighten audit and enforcement processes, I’d also like to see a tightening of the CVA framework to afford better protection to creditors. Too often we’ve seen struggling companies being taken down by the owners (the selfsame people whose stewardship of the company has got it into trouble in the first place) and then buying the assets back under a CVA, before carrying on where they left off. I fully understand the need for suppliers to do due diligence on their customers’ ability to pay, but if the auditors can’t be relied on to flag up issues, or the FRC to exercise critical oversight, they are denied vital information.